Intriguing story and breathtaking art are the ingredients of “Black Science”! “There is no authority but yourself.” So says Grant McKay, one of the main characters in “Black Science, Volume 1: How to Fall Forever.” As Grant and the other explorers of myriad dimensions and alternate universes will soon discover, that declaration is not entirely true. Writer Rick Remender, artist Matteo Scalera, colorist Dean White, and letterer Rus Wooten drop their protagonists into surprising places and situations that help to transform their views and expectations. The world (or worlds) they interact within are turned upside down in ways expected from great science fiction yarns. Scientist Grant McKay, his crew, and his children discover there is no authority or stability when one is thrown from one dimension to another. There is only chaos. Remender is a consummate storyteller and is adept at creating a story and world based on science fiction that contains a depth of emotion, character, and exciting drama. There are unexpected twists and developments that make for a rich and rewarding book that begs to be read multiple times. Contributing to that richness of this volume is the artistic team of Scalera and White, who bring a vibrant and painterly quality to the book. Not only does “Black Science” entertain the reader, but it also has characters that are sympathetic and all too human. Grant McKay and his Anarchist League of Scientists have discovered “black science” and knocked down “barriers of reality” in the process. Remender’s imagination is unrestrained and exuberant, yet never overwhelms or confuses the reader. McKay, his children, his team of scientists, his boss Kadir, and his protector Ward are lost in space and thrown to a myriad amount of worlds that the pillar chooses to toss them into. This “pillar” is the device that is able to take them to “alternate dimensions.” Powering the pillar is “the onion”, which is “the building block of infiniology.” What is infiniology, dear reader? It’s “the theory that anything you can imagine exists in some layer of the eververse.” By using this device and traveling to those layers of alternate timelines, McKay is hoping to one day find the answer to mankind’s every problem. With such lofty and impossible intentions, Remender sets a story up that explores, and hopefully will continue to explore, the complex reasons and motivations that compel humanity to act and think the way that they do. Remender’s story has many characters, yet each are uniquely defined within a world (and worlds) that is (are) equally defined. Remender drops the reader into the action without first giving any background. As the tale unfolds, the reason for Grant McKay and his cohorts’ predicament is told brilliantly through superb narration, intermittent flashbacks, and dialogue that never sounds stilted. Unlike lazy and formulaic writers, he doesn’t have to talk down to the reader by explaining every plot point or character motivation right away. 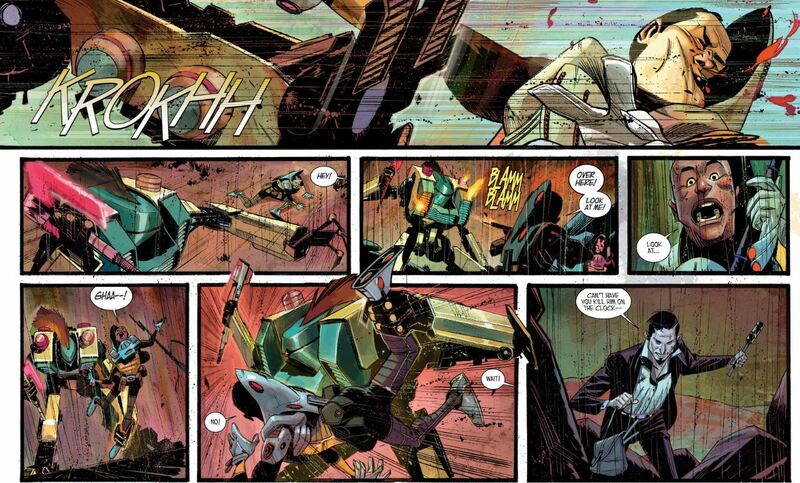 Remender writes great action and elicits emotions from the reader in sometimes unexpected ways. By the time this first volume is finished being read, he has coerced the reader to care for each one of the book’s characters and their fates. Matteo Scalera’s art is dynamic, exciting, and frenetic to the point where the action feels as if it’s going to pop off the page. Whether depicting battles involving robots, amphibious creatures, or futuristic Native Americans from another dimension, Scalera is a virtuoso at utilizing panel arrangement and “direction” within those panels. The war scenes have just as much impact and explosiveness as the interactions between the characters. 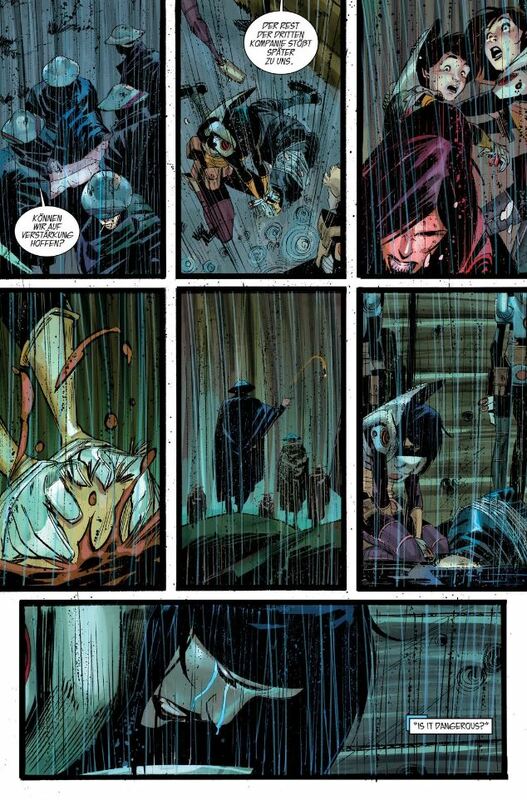 One particular series of scenes in the third issue exemplifies this adroitness at both explosive war scenes and moments of intense human emotion. As Ward and Kadir attempt to survive battle against robots, the reader is able to feel the kick to the face that a robot lands on Ward’s face. His face is squished to one side as blood flows like a waterfall from his mouth and nose. Scalera, here and throughout the book, uses motion lines to aid in the book’s feeling of being alive and immersing the reader in the experience. As the robot explodes, Dean White’s colors pop with an intensity that adds impact to Scalera’s art. Directly following this scene between futuristic robot warriors and the two space explorers, a German soldier screams for help. In order to protect herself and Grant’s children, Rebecca must prevent the other German soldiers from discovering them. Because of their language barrier, Rebecca holds the soldier’s head underneath the water and ends up drowning him. As she holds his head down, she looks up toward the cliff where the other soldiers are searching for their comrade. The perspective of the panel adds to the tension, with the reader looking from below Rebecca and seeing her chin as she looks up toward the cliff. She is only trying to survive. In one panel, she is red with rage as the children watch from behind her with faces of fear and disbelief. Scalera’s wide-eyed children and intense face of Rebecca are just another example of his artistic expertise. In the final panel of this scene, Rebecca’s eyes are closed and tears stream down in pure anguish and guilt at what she hopes is something she had to do in order to survive and protect the others. 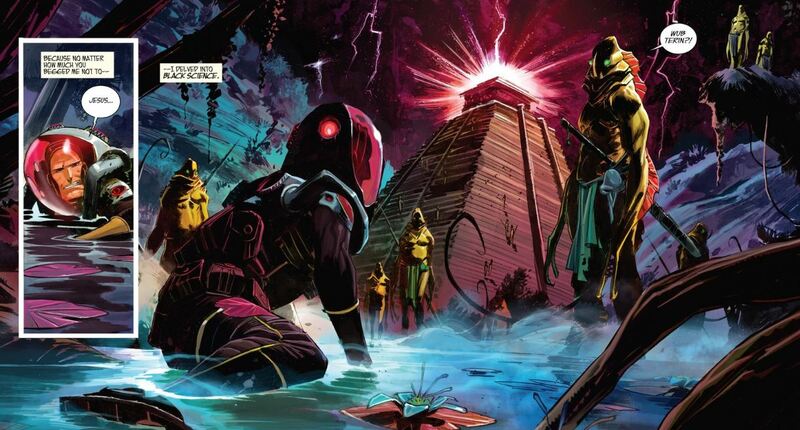 Scalera and White bring life to Remender’s story. Dean White’s colors contribute to the painterly stylings of the book. From the very first page of the first issue, White’s colors are shown to be a vital reason why “Black Science” is such a work of art. The pink lightning and purple sky are preternatural and have a 3-D quality that immerses the reader into a book. White’s coloring on this book is proof of how important colors are to a comic book and how they can enhance the art to another level. Lightning drips color as a gigantic turtle carries a pyramid that emanates a glowing green light. The blue and white electricity that shoots from frog-people is, for want of a better word, electrifying. It crackles off the page and makes the reader duck for cover. White’s coloring makes the comic book an even more immersive experience than it already is, just by the beauty he conjures with his coloring. Rick Remender, Matteo Scalera, Dean White, Rus Wooton, and editor Sebastian Girner have crafted a science fiction story full of excitement, intrigue, unexpected happenings, and, of course, creatures of wonder and (at times) disgust. One need not be fond of science fiction to read “Black Science”. It’s simply a great book with relatable characters, high concepts, and otherworldly dimensions just waiting to be explored and looked upon with astonishment. Family drama, scientific exploration, philosophical questions, and good old-fashioned action are mixed in a stew of a story that is not scientific at all: it’s just plain fun.